Gateway to French Melodies leads us into a fragrant garden of poetry and music that is both passionate and refined. 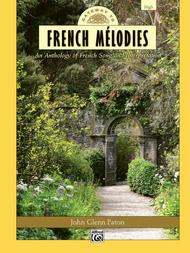 Each song brings to life one of the great themes of French art---love, nature, the purpose of life---with sensuous beauty, beguiling grace, and often with humor. Understanding what you sing is the basic concept of the Gateway series. Each lyric is translated, both word-by-word and in readable English. The singer can learn the song with confidence, as obscure points of phonetics, grammar and interpretation are made clear. The cultural context of each song is illuminated, along with its place in the life and works of the composer. The comb binding creates a lay-flat book that is perfect for study and performance.